Do you struggle on a daily basis to find items in your refrigerator? Does the ketchup bottle always seem to be hiding behind the milk carton? Does the jar of pickles vanish on the top shelf behind the eggs? And didn’t you just put the cheesecake on the second shelf? Omega Force Services offers refrigerator repair in the Twin Cities area. We understand how sometimes you want to be able to find items in your fridge without emptying the entire shelf. Below, we’ll offer helpful tips to help you get organized in your refrigerator. Contact us today if you need appliance repair! Clean out your fridge. In order to organize your fridge, you need to know what’s in it — and what shouldn’t be in it. From leftovers that are two weeks old, takeout containers that have one french fry in it, and sauce jars that have mold growing on the top, odds are you need to throw away some food and condiments (or if you have a dog, make his or her day). Open jars and check for mold. Check expiration dates. Open all containers of leftovers. 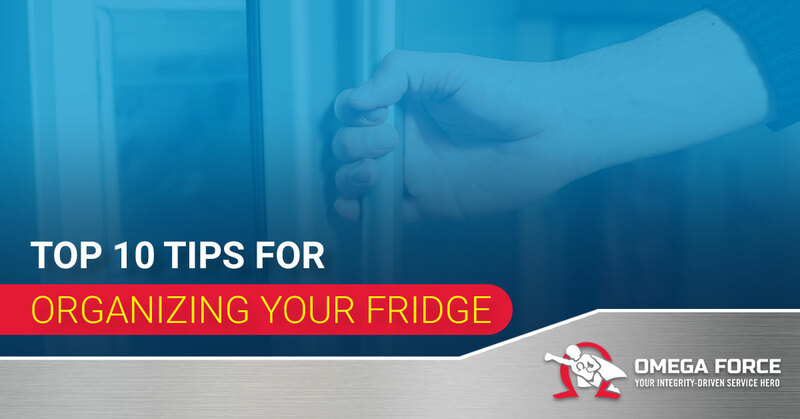 Once your entire fridge’s contents have been gone through, it’s time to clean the inside of your fridge. Wipe all surfaces. Remove the shelves if possible and scrub any food stains. Remove the drawers and do the same. And while you’re at it, do this same process with your freezer. Odds are, you’ll find at least some old ice cream containers no one is going to eat. Once this is done, you’ll be amazed at how much space these unwanted items were taking up. Adjust your shelves. Stand back, and size up your refrigerator’s shelves with your items still standing on the countertop. Do you have a lot of tall items that require a shelf to be raised? Do you not need as tall of a space and can make the middle row bigger? Adjust your drawers as well for what you normally store in them. This can create space in your refrigerator, making it easier to find food and drink items. Consider shelf liners. Shelf liners line your fridge’s shelves and are disposable. That way, when something leaks or spills or vegetables rot, it’s easy to clean up and remove. It’ll also save you from contaminating nearby items since these liners catch and hold messes. Group like items together. A place for everything, and everything in its place is the saying, and it’s true. Put condiments all together (in the same removable container if possible, so when you need the less-used horseradish sauce, you’ll know which section of the fridge to go to. Keep the same items in the same places. This is possibly the most frustrating part of living in a family: when the whipped cream container has been moved from where you just placed it. However, do your best to keep items in the same place, so when you need them, you’ll know right where to go. Put the most used items up front. Milk, eggs, orange juice, condiments, and drinks should all go up front. This prevents digging around for them and having to move items all the time. Also, put items you want eaten first up front, so it’s easier to grab. For example, if you want your kids to eat more fruits and vegetables, put those in front of the milk, so your kids will grab them instead of the piece of cake in the fridge. Put the about to expire items up front. Invest in a container and label it “Eat Me!” Use this box for items that are about to expire, such as yogurt containers. This is a great reminder to you and your family and will save you money in the long run on wasted food. Invest in fridge space savers. Nowadays, there are a lot of after-market items you can buy to save space in your fridge and help with organizing your fridge. One of these is a bottle or can dispenser that allows you to stack your soda cans and pull out one at a time with it being replaced by another one. You can buy magnets to stick to the top of your fridge that will hold drinks for you, freeing up the space below. Sliding bins with handles make organizing easy, and adding in a lazy Susan for those rolling vegetables will keep them in place. Hanging baskets for the kids snacks make for easy access (and less fridge doors left open). Curtain ring clips can be used to hang bagged items such as salad mixes and shredded cheese bags from. This will keep them fresh and keep them from spilling. Add a deodorizer. Fridges can take on odd smells due to the variety of foods in there (and rotting foods as well). Adding in a deodorizer, such as baking soda, is a great way to remove unwanted odors. At the end of a long day at work, picking up the kids from school, running them to after school activities, and then returning home to cook dinner, the last thing you want to do is fight your fridge for the items you need to make a great, home cooked meal. Having a clean, organized fridge will speed up your cooking time and eliminate those frustrations as you pull item after item from the fridge and STILL can’t find what you’re looking for. Omega Force Services in the Twin Cities believes in going above and beyond for our clients when they need appliance repair. We offer fridge repair, dishwasher repair, washer and dryer repair, oven repair, and freezer repair. We understand how tied we are to our appliances and how stressful it can be when your washing machine decides to quit working on the day you need to wash a pair of pants for work. We are family-owned and operated and work hard to make sure your family is treated as one of our own. Omega Force Services desires to fix your dysfunctional appliance promptly and efficiently. We’ll come out to your home or business, diagnose the problem, fix it, and help you understand what went wrong so if possible it doesn’t happen again. If your appliance is covered by any home warranty service, we do our best to work with them as well. We are diligent in our appliance repair work and do everything in our power to make your appliance repair easy. Contact us today in the Twin Cities area!